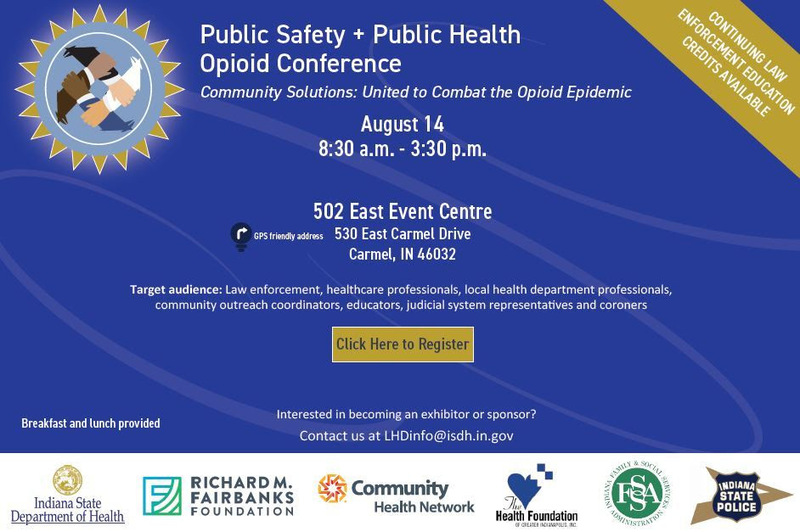 Register for the 2018 Public Safety + Public Health Opioid Conference being held on Tuesday, August 14th at 502 East Event Centre in Carmel, IN. The goal of this conference is to showcase how Public Safety and Public Health are strategic partners in the fight against the opioid epidemic. This activity has been approved by the Indiana Law Enforcement Training Board. Participating Law Enforcement Officers, Support Personnel, and Emergency Services Providers are eligible to receive up to 4.5 hours of credit hours. The conference agenda is here https://www.in.gov/isdh/files/2018Agenda-Opioid%20Conference.pdf . Feel free to share this with your colleagues.